Al Jubori receiving top honours in Dubai. 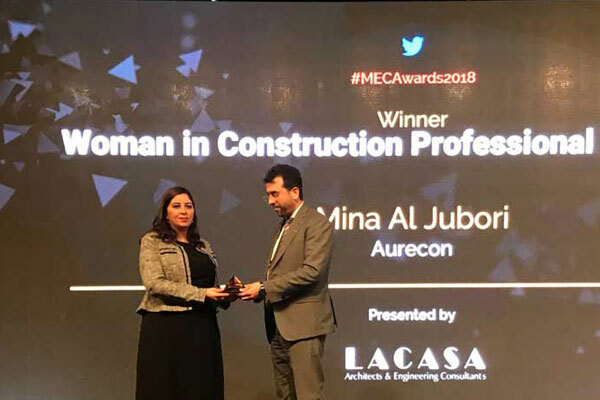 Aurecon, a leading engineering and infrastructure advisory company, said its country manager for Abu Dhabi and client director for infrastructure in the Middle East region, Mina Al Jubori, has become the first winner of 'Women in Construction: Professional of the Year' award at this year’s Middle East (ME) Consultant Awards ceremony held in Dubai. Reflecting the changing landscape of the Middle East region’s engineering profession, the prestigious Middle East (ME) Consultant Award for 2018 introduced this new category to honour women in the male-dominated construction sector. The award category attracted 20 nominations and competition was fierce. It was designed to recognise female engineering professionals who have delivered exceptional work over the past year, while also earning the respect of colleagues, peers and clients. All nominees must also have worked directly in regional construction projects. The awards were given at a colourful ceremony held at the Ritz Carlton, Dubai, UAE. The move was aimed at recognising the region’s best companies, projects and talents from across a variety of fields in the engineering industry. Winners were chosen by a panel of judges and announced at the organisation’s annual gala dinner. A civil engineer by training with an MBA specialising in operations and project management, Al Jubori has nearly two decades of experience, delivering solutions for major multi-disciplinary infrastructure projects in the Middle East and Australia, including the Khalifa Port and Industrial Zone Development Programme in the UAE; the Sohar Port and Industrial Zone in Oman; and the Sydney International Container Terminal in Australia. Having grown up in Iraq, Al Jubori lived through some of the country’s most difficult years, said the statement from Aurecon. She also experienced many challenges trying to break into the male-dominated world of engineering in the Middle East. Nevertheless, her intellect, creative thinking and determination have delivered success and shaped her as a leader; respected by clients, colleagues and partners, it added. On the achievement, Al Jubori said: "I had to go the extra mile to prove myself in my career. But the respect I get is earned. Yes, I am a woman. But first and foremost, I am an engineer. I feel truly honoured to receive this award, and I hope in some ways my story will inspire other women to think of a career in STEM." "Being at Aurecon has enabled me to be a part of some truly spectacular projects while working at a company that shares my beliefs. I hope we can bring more women into our profession and make ‘#womanengineer’ an obsolete hashtag," she added. Aurecon’s regional director for the Middle East, Ermis Marques – himself the recipient of ME Consultant’s Executive of the Year Award in 2017 – said the top recognition confirmed Al Jubori’s determination and resilience. It is also a ringing endorsement of the company’s diversity and inclusion policies in action, he stated. "We are all delighted for Al Jubori; it’s a recognition she thoroughly deserves. Through her drive and fearlessness, she has turned adversity into triumphs" noted Marques.